The Rapid Action Battalion is accused of using torture and extrajudicial executions in its crime fighting operations. The nation's home minister says the group shoots only in self-defense. 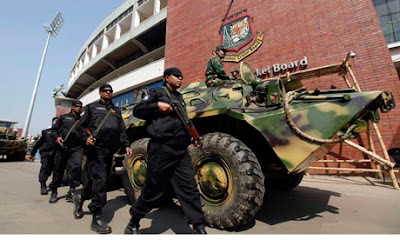 A human rights group urged Bangladesh on Tuesday to end torture, extrajudicial killings and related abuses by an elite anticrime force that the organization said had killed nearly 200 people since January 2009, including many allegedly executed while in the unit's custody. Human Rights Watch further called on the Asian nation to disband the Rapid Action Battalion if its record doesn't improve. Brad Adams, the group's Asia director, said he doesn't have an exact figure for the number of the reported deaths involved extrajudicial killings since the government of Prime Minister Sheik Hasina Wajed came to power 28 months ago, in part because Human Rights Watch didn't investigate every case. But the number of "crossfire" deaths, a blanket term the unit uses to justify many of its killings, was significant, Adams said in a telephone interview from Dhaka, the Bangladeshi capital. 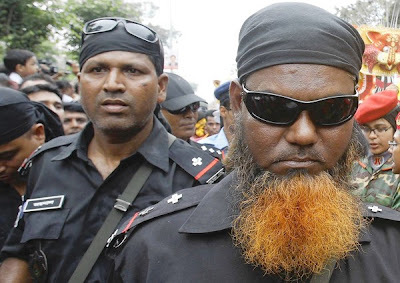 Bangladeshi Home Minister Shahara Khatun, who oversees the battalion, also known as RAB, criticized the rights group's conclusions. "RAB personnel only retaliate in self-defense," Khatun said, according to the Bangladeshi online newspaper BDNews24.com. "RAB do not kill anyone, but shoot only when criminals do." Human Rights Watch says in its 53-page report released Tuesday that the ruling Awami League strongly criticized the rapid-action force when it was in opposition, only to defend its deadly record once the party came to power. No member of the force or other official has ever been prosecuted for a crossfire killing or other human rights abuse, the report says. The ruling party's unwillingness to act reflects in part a fear of the army, which has staged coups against civilian leaders and jailed Wajed during a caretaker government, Adams said. It also doesn't want to appear soft on crime, he said. The rapid-action force, formed in March 2004 amid a crime wave, draws on members of the army, air force, navy, police and other law enforcement groups who serve for a limited time before returning to their units. The battalion, which supporters credit with stemming militant Islamic groups, has killed 732 suspects since its inception. Human Rights Watch urged foreign governments, including the United States and Britain, to stop working with the battalion until it ended the alleged extrajudicial executions and torture. Both countries have provided human rights training, and Britain also schooled battalion members in interrogation techniques, according to May 2009 diplomatic cables released by the WikiLeaks group. Tahasin Ahmed ©. Travel theme. Powered by Blogger.